Marc shares some of what happened on this day in history, including the day Douglas Wilder becomes the first African American to be elected as governor of a U.S. state, and the day in 1990 when the National Football League responded to the state of Arizona’s refusal to observe a Dr. Martin Luther King Jr. Holiday by rescinding their plan to hold the 1993 Super Bowl in Phoenix. We were deeply saddened to learn of Veronica Dorsey’s death. We are losing a hero. She was a passionate leader, not only in the United Workers, but in the movement to end poverty. She inspired countless people and touched so many lives. We lost her too soon and she will be sorely missed. The funeral will be on Friday, November 8, at Pleasant Hope Baptist Church (430 E Belvedere Ave, Baltimore, MD 21212). The wake is at 10:30am. Service will begin at 11am. In lieu of flowers, her family is asking people to make a donation to the United Workers (PO Box 41547, Baltimore, MD 21203). We are planning a memorial event to take place some time in December. We’ll be updating you with details once they become available. In the coming days, we will be posting more stories, photos, and videos of Veronica to remember her life and honor her memory. If you would like to share your stories or photos, please send them to mike@unitedworkers.org or call us at 410-230-1998. 1519: According to some sources, Spaniards have their first view of Tenochtitlán (modern Mexico City). 1794: After over a year of raids by both the Americans and the Chickamaugas, the Chickamaugas have been beaten down. In a meeting arranged last month, Tennessee Governor William Blount meets with Cherokee and the offshoot Chickamauga Chiefs at the Tellico Blockhouse near the Tennessee and North Carolina border. Forty Chiefs are present, including John Watts (Young Tassel), Hanging Maw, and Bloody Fellow, and they agree to a peace. They also agree to exchange prisoners on December 31, 1794. 1811 : The Shawnee had set up camp at the confluence of the Tippecanoe and Wabash rivers in Indiana, and called on the surrounding tribes to rise up. The governor of the Indiana Territory brought soldiers into the area and the Native Americans attacked them on November 7th, 1811 . The soldiers won and the Tippecanoe settlement was pulled down. 1922 : According to a report made from Paris, allied nations requested help from their governments. This action was taken in order to help keep order in Constantinople, the former capital of the Ottoman Empire. Constantinople is the present-day city of Istanbul, which is in Turkey. This was the year of the fall of the Empire, which was run by the Romans in ancient times. 1929 : The Museum Of Modern Art is opened in New York City with the help of Abby Aldrich Rockefella and friends Abby was the wife of John D. Rockefella Jr. The Museum was devoted exclusively to modern art and the largest and most comprehensive of it’s kind in the United States. 1935 : It was possible that a naval parity (equality) agreement would be reached between countries such as the U.S., England, and Japan. However, it was also evident that both the United States and England would not be willing to alter the 5-5-3 military ratio limitations outlined by the Washington Treaty, which was soon to expire. 1940 : Strong winds gusting to 35 MPH break the the Narrows suspension Bridge to pieces in Tacoma, Washington causing the bridge to fall to the bottom of Puget Sound . 1942 : Allied forces invade North Africa . 1944 : President Roosevelt is elected to fourth term defeating Thomas E. Dewey during World War II. 1956 : General D Dwight Eisenhower is reelected to the White House . 1956 : Following President Nasser of Egypt announcing that all assets of the Suez Canal Company had been frozen and would be nationalized, France, Britain and Israel attack Egypt taking control of the Suez Canal, On this day in History The United Nations General Assembly adopts a resolution calling for the United Kingdom, France and Israel to immediately withdraw their troops from Egypt, because the US was backing the United Nations Resolution Britain, France and Israel had no choice and withdrew from Egypt 1 week later. 1962, Nelson Mandela is sentenced to five years for “incitement and leaving South Africa illegally. Mandela was identified as the “mouthpiece and mastermind” behind a call for a national strike and a founder member of the Umkhonto we Sizwe (Spear of the Nation), he was smuggled out of South Africa to speak at an African freedom conference in Addis Abada. 1967 : President Lyndon B. Johnson signs the Public Broadcasting Act establishing the The Corporation for Public Broadcasting (CPB) to promote public broadcasting. 1967 – Carl B. Stokes (Cleveland, OH) and Richard G. Hatcher (Gary, IN) won mayoral elections. Stokes was the first Black to serve as mayor of a major American city. 1969, The Rolling Stones kicked off their 6th North American tour at Fort Collins state University, Colorado. Also on the bill was Ike and Tina Turner, Chuck Berry and BB King. 1972 : Richard Nixon wins an overwhelming majority in the US presidential elections for a second term in the White House. 1973 : After former Secretary of State Henry A. Kissinger and Egyptian President Anwar Sadat met, the agreement was that they were moving towards peace. However violent fighting was occurring along the Suez Canal at the same tine Kissinger and Sadat had met. It would take awhile to make a considerable amount of progress, but this was considered a start. At the time it was thought of as something that was at least worth a try. 1983 : A bomb is exploded at the United States Senate building by members of a group claiming to be the “Resistance Conspiracy” in protest to U.S. military involvement in Grenada and Lebanon. Members of the terrorist group were charged and bought to trial and found guilty for the U.S. Senate bombing and bombings of Fort McNair and the Washington Navy Yard. 1985 : Half-dozen American hostages were being held, presumably in Lebanon. An anonymous caller had said that an Islamic Jihad had planned to take the lives of these Americans. Then, a second caller indicated that these hostages were dead. However, this report was proven to be unsubstantiated, so the hostages in question were reported missing at this time. 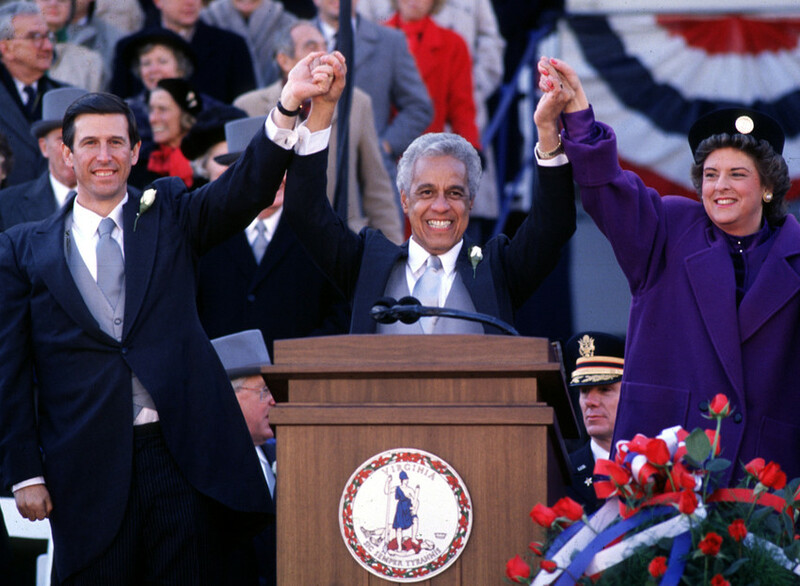 1989 : Douglas Wilder becomes the first African American to be elected as governor of a U.S. state when he is elected as the Governor of Virginia. The win was predicted in the polls with a large majority but on the day of the polls he was elected with a majority of less than half a percent. The difference is polling numbers and actual voting is sometimes called the The Bradley effect or less commonly called the Wilder effect. 1990 – In response to the state of Arizona’s refusal to observe a Dr. Martin Luther King Jr. Holiday, the National Football League responded, on this date in 1990, by rescinding their plan to hold the 1993 Super Bowl in Phoenix. 1991 : Magic Johnson the Basketball legend announces he will retire from the Los Angeles Lakers after testing positive for HIV . 1995 : Former U.S. Defense Secretary Robert Mc Namara visited Hanoi, Vietnam. This was the capital city and central location of enemy troops that fought during the Vietnam War. This was the first time Mc Namara had been to Vietnam since the end of the war in 1975. He hoped that this meeting would help the United States learn from the mistakes made during this war. Likewise, Mc Namara was the one who first encouraged the war and then later thought of it as a mistake. 2000 : Hillary Rodham Clinton, wife of President Clinton, has won a seat for the Democrats representing New York in the Senate to become the only First Lady to win elective office in US history. 2000 : In one of the most controversial Presidential Elections in modern times between Al Gore ( Vice President ) and Republican candidate George W. Bush. In the first major election of the 21st century, many Florida voters felt disenfranchised when they were not allowed to vote or had their votes go uncounted on this date in 2000. As a result, George W. Bush claimed Florida’s 25 electoral votes and the Presidency with fewer popular votes and possibly fewer votes in Florida than his opponent Al Gore. Many Blacks and others protested this result. 2006 : A list of 13 ‘enemies of the Internet’ has been released by the human rights group Reporters Without Borders (RSF). The list consists of countries that the RSF believes are suppressing freedom of expression on the Internet. Egypt has been added to the list while Nepal, Libya and the Maldives have all been taken off it. The complete list of blacklisted states is: Belarus, Burma, China, Cuba, Egypt, Iran, North Korea, Saudi Arabia, Syria, Tunisia, Turkmenistan, Uzbekistan and Vietnam. 2008 : The Pakistani government has said that a US missile strike in the country’s north-west has killed about eleven people. The attack is by a US drone that was targeting Taleban militants in the tribal region of North Waziristan, which is close to the Afghan border. Locals say that a house of fighters loyal to a Taleban commander was hit. The US has not confirmed the attack. 2009 : The House of Representatives has approved a sweeping overhaul of the nation’s health care system, advancing legislation that could stand as one of the Democrats most important social policy achievements. 1847 – Charlotte “Lotta” Mignon Crabtree (November 7, 1847 – September 25, 1924) was an American actress, entertainer and comedian. She was also a significant philanthropist. 1879 – LEON TROTSKY – Russian communist revolutionary who was the the founder and first leader of the Red Army, which toppled the Russian Monarchy in 1917. 1903 – DEAN JAGGER (1903-1991) Movie actor who played Principal Vane on TV’s Mr. Novak. 1913 – ALBERT CAMUS (1913-1960) French Nobel Prize winning author, journalist, and philosopher, he wrote The Stranger and The Plague. 1914 – ARCHIE CAMPBELL (1914-1987) Writer and star of the popular country-western television show, Hee Haw. 1922 – AL HIRT (1922-1999) New Orleans trumpeter who recorded Dixieland hit ‘Java’ (1964). 1926 – JOAN SUTHERLAND (1926-2010) Operatic coloratura soprano who sang in the Bel Canto style and played the title role in Alcina in 1960. 1942, Born on this day, Johnny Rivers, US singer, songwriter, (1966 US No.1 single ‘Poor Side Of Town’ plus over 15 other US Top 40 hits). 1943 – Joni Mitchell born, Folk singer-songwriter whose album Blue is considered one of the greatest albums of all time by Rolling Stone. 1950 – Alexa Canady, the first Black woman neurosurgeon, was born in Lansing, MI. Canady has also served as National President of Delta Sigma Theta Sorority. 1952 – DAVID PETRAEUS – Four-star U.S. Army General who served in Iraq and Afghanistan and was appointed Director of the C.I.A. in 2011. 1954 – KAMAL HAASAN – One of India’s greatest film artists of all time who acted, produced and directed popular titles for over 50 years. 1964 – Dana Michelle Plato (November 7, 1964 – May 8, 1999) was an American actress notable for playing the role of Kimberly Drummond on the U.S. television sitcom Diff’rent Strokes. 1970 – Morgan Spurlock, Producer of Super Size Me, a documentary of what can happen when someone lives off of a diet consisting only of McDonald’s food.